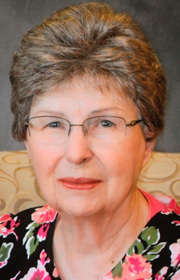 Funeral services for Mary Jane Blair, 86, of Jeff­erson, formerly of Paton, will be held at 10:00 am Thursday, April 11, 2019 at Trinity Lutheran Church in Jefferson. Interment will be in the Paton Township Cemetery. The family will greet friends from 4:00 – 7:00 pm Wednesday, April 10, 2019 at Slininger-Schroeder Funeral Home in Jefferson. Survivors include her two daughters: Loretta (Brent) Goughnour and Lisa (Jack) Fredrickson, both of Jefferson, IA; a brother: Dr. James (Linda) Rundle of Indianola, IA; sisters-in-law: Donna Blair of Jefferson, IA and Anita Rundle of Americus, GA; six grandchildren and 13 great-grandchildren; other relatives and many friends. Memorials in Mary Jane’s name may be given to the family.